White Denim show off their versatility and eclectic abilities on their latest album, Performance. Their eighth full-length record has the Austin, Texas four-piece easily adapting their sound to genres as disparate as funk (“Double Death”) and boogie rock (“It Might Get Dark”) while never abandoning their garage roots. Performance opens with what sounds like a radio nob spinning through stations before landing on the album’s opening track, “Magazin”. The scanning radio intro is a well-suited sonic representation for the record, as Performance aims to showcase the band’s strengths while channeling a variety of styles. 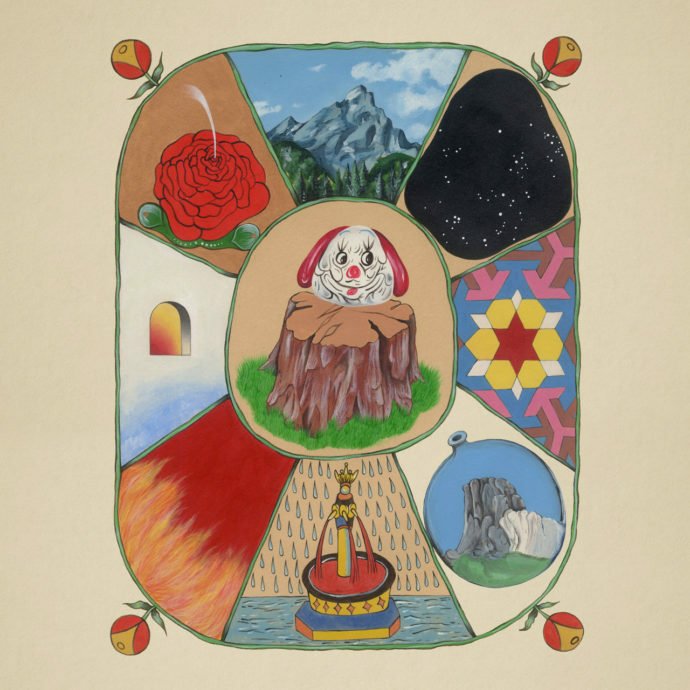 “Shined teeth, grinding up the moon, nice dream, lying in your room,” White Denim’s lead singer and guitarist, James Petralli, sings during the song’s chorus amidst an appropriately raw-sounding brass section and a chug-a-chug rhythm. The album’s comparatively short title track follows and has Petralli’s excellent guitar work on full display as he races along with Conrad Choucroun’s stellar percussion. The end of the first third of Performance is reached with “Fine Slime”, a track that intermingles proggy chord shifts and rhythmic shakeups with more of Petralli’s phenomenal lead work. The funky “Double Death” arrives at Performance’s halfway point and sounds like Parliament collaborating with the Black Keys. Michael Hunter’s retro organ and groovy effects blend nicely with the rest of his bandmates’ soulful approach. Midway through, the song shifts from psychedelic soul into a jam band groove and back again. The last third of Performance has White Denim showing off their jazz and progressive rock skills. Both “Sky Beaming” and “Backseat Driver” are breezy, upbeat numbers that provide a running-through-a-meadow-on-a-sunny-day feeling. This isn’t to imply either song is simplistic. On the contrary, both tracks have all the band members working overtime, utilizing shifting time changes and complicated arpeggios while remarkably maintaining a sentiment of joy and optimism throughout. Performance ends with “Good News”, a song that has Petralli in full-on crooner mode vocally. The song is perhaps the most straightforward of the lot, beginning with a charmingly strummed acoustic guitar and bubbling synths before a fuzzed-out lead guitar adds a healthy dose of psych-tinged garage rock flavor to the mix. Throughout Performance, White Denim makes adapting their sound to fit other genres look easy. And while the group proves they can deftly maneuver through a variety of styles, oftentimes within the same song, the same can’t be said of the emotional range on this collection. All nine of the songs here are decidedly buoyant. It would have been a refreshing changeup to hear the band attempt a somber blues number or at the very least a melancholic torch song. Regardless, if you’re looking for an exhilarating rock record from a band that isn’t easily categorized, look no further than White Denim’s Performance.